I want to debug Java plugins. Please help me! Pls. provide some more details on what you would like to achieve, what you have already tried and where you would need assistance. Otherwise you won’t get any helpful responses. I want to run GMSC and I want to attach a debugger to the code and to put breakpoints inside the code in order to access variables. Define Debug Configuration - Right Click on Project > Debug as > Debug Configurations. In the Debug Configurations Window > Double Click on Java Application on the left side panel. In the New_configuration – > In Main Tab > Check if your Project Name is correct. Type the Name of the main class as - com.intergraph.web.SmartClient. Go to JRE Tab > Select Project JRE. Go to Classpath Tab > Click on Bootstrap Entries > Click on Advanced > Select Add Library > Next. Select GMSC_15 and click Finish. The GMSC_15 is displayed under Bootstrap Entries. Click on Apply and then Click Debug. It seems that this is for Eclipse. I am using Netbeans. Can you help me with Netbeans also? 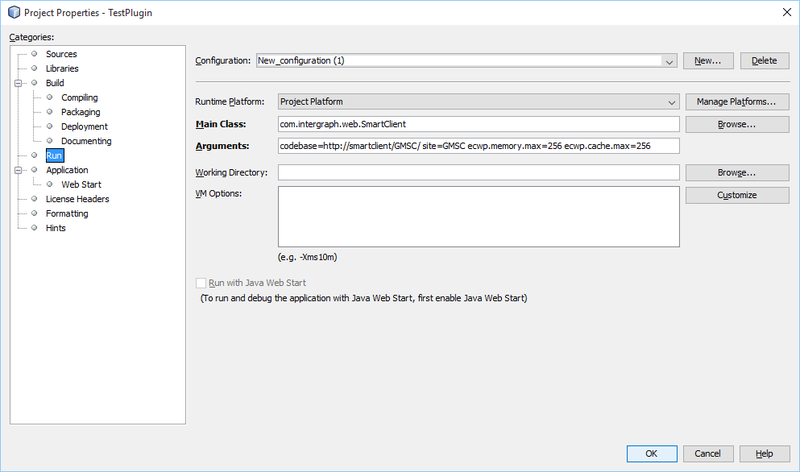 I also tried to develop plugins in NetBeans, but I left it after few days, because as I know, nobody from the development team uses NetBeans - so you will be alone and in case you need to share whole project with the development team - you need to migrate it to the Eclipse. Actually, I would not recommend you to use NetBeans for GMSC plugins.